June 6, 2014 – NXT Live Event: Carmella defeated Devin Taylor. June 7, 2014 – NXT Live Event: Devin Taylor defeated Carmella. June 20, 2014 – NXT Live Event: Alexa Bliss and Becky Lynch defeated Carmella and Sasha Banks. June 27-28, 2014 – NXT Live Event: Alexa Bliss and Becky Lynch defeated Carmella and Sasha Banks. July 12, 2014 – NXT Live Event: Becky Lynch defeated Carmella. August 21, 2014 – NXT Live Event: Alexa Bliss and Becky Lynch defeated Carmella and Kendall Skye by disqualification. August 21, 2014 – NXT: Natalya defeated Carmella in a dark match. August 23, 2014 – NXT Live Event: Alexa Bliss and Becky Lynch defeated Carmella and Kendall Skye. August 29, 2014 – NXT Live Event: Carmella and Sasha Banks defeated Becky Lynch and Kendall Skye. August 30, 2014 – NXT Live Event: Alexa Bliss and Becky Lynch defeated Sasha Banks and Carmella. September 5, 2014 – NXT Live Event: Carmella and Sasha Banks defeated Alexa Bliss and Becky Lynch. September 6, 2014 – NXT Live Event: Carmella and Sasha Banks defeated Alexa Bliss and Kendall Skye. October 2-4, 2014 – NXT Live Event: Alexa Bliss and Bayley defeated Carmella and Dana Brooke. October 9, 2014 – NXT Live Event: Alexa Bliss, Bayley and Charlotte defeated Becky Lynch, Carmella and Dana Brooke. October 16, 2014 – NXT: Carmella w/Colin Cassady and Enzo Amore defeated Blue Pants (Leva Bates). October 30, 2014 – NXT: Carmella defeated Emma. November 27, 2014 – NXT: Carmella w/Colin Cassady and Enzo Amore defeated Blue Pants (Leva Bates). December 4, 2014 – NXT Live Event: Becky Lynch and Sasha Banks defeated Carmella and Bayley. December 5-6, 2014 – NXT Live Event: Bayley and Carmella defeated Becky Lynch and Sasha Banks. December 18-20, 2014 – NXT Live Event: Alexa Bliss defeated Carmella and Dana Brooke in a 3-way match. January 1, 2015 – NXT: Blue Pants (Leva Bates) defeated Carmella w/Colin Cassady and Enzo Amore. February 4, 2015 – NXT: Carmella w Enzo Amore and Colin Cassady defeated Emma. March 7, 2015 – WWE Experience: Charlotte defeated Carmella. March 8, 2015 – WWE Experience: Carmella defeated Alexa Bliss. Dana Brooke defeated Carmella. March 12, 2015 – NXT Live Event: Bayley defeated Carmella. March 29, 2015 – NXT Live Event: Carmella and Colin Cassady defeated Devin Taylor and Marcus Louis. April 2, 2015 – NXT Live Event: Bayley and Carmella defeated Becky Lynch and Dana Brooke. April 3, 2015 – NXT Live Event: Bayley defeated Carmella. April 9, 2015 – NXT Live Event: Bayley and Carmella defeated Becky Lynch and Dana Brooke. April 18, 2015 – NXT Live Event: Bayley and Carmella defeated Becky Lynch and Dana Brooke. May 2, 2015 – NXT Live Event: Carmella and Becky Lynch defeated Sasha Banks and Devin Taylor. May 7, 2015 – NXT Live Event: Bayley and Carmella defeated Lina and Devin Taylor. May 8, 2015 – NXT Live Event: Bayley and Carmella defeated Jessie McKay and KC Cassidy. June 12-13, 2015 – NXT Live Event: Bayley and Carmella defeated Dana Brooke and Emma. June 24, 2015 – NXT: Colin Cassady and Enzo Amore w Carmella defeated Jason Jordan and Sylvester LeFort. July 1, 2015 – NXT: Emma defeated Carmella. July 8, 2015 – NXT: The Vaudevillains defeated Colin Cassady and Enzo Amore w Carmella to become #1 contenders for the tag team titles. July 9, 2015 – NXT: NXT women’s champion Sasha Banks defeated Carmella to retain the title. July 10, 2015 – NXT Live Event: NXT women’s champion Sasha Banks defeated Carmella in a non-title match. July 11, 2015 – NXT Live Event: Carmella and Gionna Daddio defeated Cassie and Lina. July 17, 2015 – NXT Live Event: Carmella and Lina defeated Dana Brooke and Cassie. July 29, 2015 – NXT: Dash Wilder and Scott Dawson defeated Colin Cassady and Enzo Amore w Carmella. August 7, 2015 – NXT Live Event: Carmella and Billie Kay vs. Dana Brooke and Eva Marie ended in a no contest. August 8, 2015 – NXT Live Event: Eva Marie defeated Carmella. August 15, 2015 – NXT Live Event: Colin Cassady and Enzo Amore w Carmella defeated Chad Gable and Jason Jordan. August 19, 2015 – NXT: Colin Cassady, Enzo Amore, Zack Ryder and Mojo Rawley w Carmella defeated ?? ?, Jesus De Leon, Jesse Sorensen and Aaron Solo. August 26, 2015 – NXT: Eva Marie defeated Carmella. August 28, 2015 – NXT Live Event: Colin Cassady and Enzo Amore w Carmella defeated Angelo Dawkins and Sawyer Fulton in the 1st round. August 29, 2015 – NXT Live Event: NXT women’s champion Bayley defeated Carmella to retain the title. September 3, 2015 – NXT Live Event: Dana Brooke and Nia Jax defeated Carmella and Peyton Royce. September 4, 2015 – NXT Live Event: Dana Brooke and Emma defeated Billie Kay and Carmella. September 9, 2015 – NXT: Carmella defeated Peyton Royce. September 12, 2015 – NXT Live Event: Bayley and Carmella defeated Emma and Dana Brooke. September 17, 2015 – NXT Live Event: Dana Brooke defeated Carmella. September 18, 2015 – NXT Live Event: Emma defeated Carmella. September 19, 2015 – NXT Live Event: Carmella defeated Alexa Bliss. September 23, 2015 – NXT: Eva Marie defeated Carmella by count-out. October 2, 2015 – NXT Live Event: Eva Marie defeated Carmella. October 21, 2015 – NXT: Colin Cassady and Enzo Amore w Carmella defeated Dash Wilder and Scott Dawson. October 24, 2015 – NXT Live Event: Emma defeated Carmella. Enzo Amore and Colin Cassady w Carmella defeated Chad Gable and Jason Jordan. October 28, 2015 – NXT: Dash Wilder and Scott Dawson vs. Enzo Amore and Colin Cassady w Carmella never got started as Wilder & Dawson attacked Enzo and Big Cass. November 4, 2015 – NXT: Carmella had an updated on Enzo and Big Cass. November 5, 2015 – WrestleMania 32 Pre Sale Party: Carmella defeated Alexa Bliss. November 7, 2015 – NXT Live Event: Alexa Bliss and Emma defeated Carmella and Marley. November 20, 2015 – NXT Live Event: Asuka and Carmella defeated Aliyah and Eva Marie. December 13, 2015 -NXT Live Event: Nia Jax defeated Carmella. December 14, 2015 – NXT Live Event: Carmella defeated Alexa Bliss. December 16, 2015 – NXT TakeOver – London: NXT tag team champions Dash Wilder and Scott Dawson defeated Enzo Amore and Colin Cassady w Carmella to retain the titles. January 9, 2016 – NXT Live Event: Billie Kay, Emma and Eva Marie defeated Adrienne Reese, Carmella and Liv Morgan. January 13, 2016 – NXT: Carmella won a battle royal to become #1 contenders for the NXT women’s title. January 15, 2016 – NXT Live Event: Eva Marie and Nia Jax defeated Carmella and Peyton Royce. January 16, 2016 – NXT Live Event: Carmella defeated Alexa Bliss. Eva Marie and Nia Jax defeated Carmella and Peyton Royce. January 20, 2016 – NXT: Bayley and Carmella defeated Emma and Alexa Bliss. February 3, 2016 – NXT: Carmella defeated Emma. February 10, 2016 – NXT: NXT women’s champion Bayley defeated Carmella to retain the title. February 13, 18-20, 2016 – NXT Live Event: Carmella defeated Peyton Royce. March 4-5, 2016 – NXT Live Event: Carmella defeated Daria. March 17, 2016 – NXT Live Event: Aliyah and Carmella defeated Billie Kay and Emma. March 18, 2016 – NXT Live Event: Bayley and Carmella defeated Billie Kay and Emma. March 24, 2016 – NXT Live Event: Carmella and Liv Morgan defeated Billie Kay and Emma. March 25, 2016 – NXT Live Event: Carmella defeated Emma. April 7, 2016 – NXT Live Event: Eva Marie defeated Carmella. April 8, 2016 – NXT Live Event: Carmella defeated Peyton Royce. April 9, 2016 – NXT Live Event: Eva Marie defeated Carmella. April 21, 2016 – NXT Live Event: Bayley and Carmella defeated Dana Brooke and Peyton Royce. April 22, 2016 – NXT Live Event: Bayley and Carmella defeated Alexa Bliss and Dana Brooke. April 23, 2016 – NXT Live Event: Bayley and Carmella defeated Dana Brooke and Peyton Royce. April 27, 2016 – NXT: Carmella defeated Aliyah. May 6, 2016 – NXT Live Event: Aliyah and Carmella defeated Dana Brooke and Peyton Royce. May 12, 2016 – NXT Live Event: Carmella defeated Peyton Royce. May 13, 2016 – NXT Live Event: Carmella and Daria defeated Lana and Mandy Rose. May 14, 2016 – NXT Live Event: Carmella and Daria defeated Mandy Rose and Peyton Royce. June 2,4, 2016 – NXT Live Event: Carmella defeated Peyton Royce. June 3, 2016 – NXT Live Event: Bayley and Carmella defeated Daria and Peyton Royce. June 11, 2016 – NXT Live Event: Bayley and Carmella defeated Nia Jax and Nicola Glencross. Carmella defeated Nicola Glencross. June 12, 2016 – NXT Live Event: Asuka defeated Carmella to retain the NXT women’s title. June 13, 15, 2016 – NXT Live Event: Bayley and Carmella defeated Peyton Royce and Nicola Glencross. June 15, 2016 – NXT: Carmella defeated Tessa Blanchard. July 7, 2016 – NXT Live Event: Bayley and Carmella defeated Daria and Mandy Rose. July 8, 2016 – NXT Live Event: Carmella defeated Aliyah. July 9, 16, 2016 – NXT Live Event: Aliyah and Carmella defeated Daria and Mandy Rose. July 23, 2016 – NXT Live Event: Carmella defeated Mandy Rose. July 28-30, 2016 – NXT Live Event: Bayley and Carmella defeated Daria and Mandy Rose. August 9, 2016 – SmackDown Live: Carmella defeated Natalya. October 4, 2016 – SmackDown Live: Alexa Bliss and Carmella defeated Becky Lynch and Nikki Bella. October 11, 2016 – SmackDown Live: Naomi defeated Carmella. December 13, 2016 – SmackDown Live: Carmella defeated Natalya. January 3, 2017 – SmackDown Live: Carmella w James Ellsworth defeated Aliyah. January 10, 2017 – SmackDown Live: Carmella w James Ellsworth defeated CJ Lunde. January 14-16, 2017 – Live Event: Naomi and Nikki Bella defeated Carmella and Natalya. January 28, 30, 2017 – Live Event: Naomi and Nikki Bella defeated Carmella and Natalya. January 31, 2017 – SmackDown Live: Carmella w James Ellsworth defeated Delilah Dawson. March 11, 2017 – Live Event: Alexa Bliss defeated Becky Lynch, Carmella, Mickie James, Natalya and Tamina in a 6-way match to retain the women’s title. March 12, 2017 – Live Event: Asuka, Becky Lynch, Nikki Bella and Tamina defeated Alexa Bliss, Carmella, Mickie James and Natalya. March 18-19, 2017 – Live Event: Alexa Bliss defeated Becky Lynch, Carmella, Mickie James, Natalya and Tamina in a 6-way match to retain the women’s title. March 20, 2017 – Live Event: Alexa Bliss defeated Carmella, Mickie James, Natalya and Tamina in a 5-way match to retain the women’s title. March 21, 2017 – SmackDown Live: Carmella w James Ellsworth defeated Becky Lynch by disqualification. March 28, 2017 – SmackDown Live: Becky Lynch vs. Carmella w James Ellsworth ended in a no contest. Alexa Bliss and Carmella w James Ellsworth defeated Becky Lynch and Mickie James. April 2, 2017 – WrestleMania 33: Naomi defeated Alexa Bliss, Becky Lynch, Carmella w James Ellsworth, Mickie James and Natalya in a 6-way match to retain the women’s title. May 2, 2017 – SmackDown Live: Carmella w James Ellsworth and Natalya defeated Charlotte Flair and Naomi. May 16, 2017 – SmackDown Live: Carmella w James Ellsworth defeated SmackDown Live women’s champion Naomi in a non-title match. May 21, 2017 – Backlash: Carmella w James Ellsworth, Natalya and Tamina defeated Becky Lynch, Charlotte Flair and Naomi. June 6, 2017 – SmackDown Live: Carmella w James Ellsworth, Natalya and Tamina defeated Becky Lynch, Charlotte Flair and Naomi. June 18, 2017 – Money In The Bank: Carmella defeated Becky Lynch, Charlotte Flair, Natalya and Tamina in a ladder match to win the Money In The Bank. James Ellsworth climbed the ladder and grab the briefcase for Carmella. June 20, 2017 – SmackDown Live: Daniel Bryan told Carmella and James Ellsworth that there will be a rematch next week reasoning of James Ellsworth getting involved in the match. June 27, 2017 – SmackDown Live: Carmella defeated Becky Lynch, Charlotte Flair, Natalya and Tamina in a ladder match to win the Money In The Bank. James Ellsworth once again got involved in the match but this time Carmella climbed the ladder to get the briefcase. July 1-3, 8-10, 2017 – Live Event: Becky Lynch, Charlotte Flair and Naomi defeated Carmella, Natalya and Tamina. July 4, 2017 – SmackDown Live: Carmella cut a promo saying she won the Money In The Bank once again and Daniel Bryan came out and suspended James Ellsworth for being involved in the Money In The Bank ladder match after he got banned from it. July 29-31, 2017 – Live Event: Becky Lynch, Charlotte Flair and Naomi defeated Carmella, Natalya and Tamina. August 1, 2017 – SmackDown Live: Naomi and Becky Lynch defeated Carmella and Natalya. August 8, 2017 – SmackDown Live: Carmella defeated WWE SmackDown Live women’s champion Naomi in a non-title match. 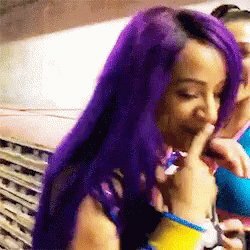 James Ellsworth cost Naomi the match and returned from his suspension. August 22, 2017 – SmackDown Live: Becky Lynch and Naomi defeated Natalya and Carmella w James Ellsworth. August 29, 2017 – SmackDown Live: Naomi defeated Carmella in a dark match. September 5, 2017 – SmackDown Live: SmackDown Live women’s champion Natalya defeated Carmella w James Ellsworth in a non-title match. September 24-25, 2017 – Live Event: Naomi defeated Carmella. September 26, 2017 – SmackDown Live: Charlotte Flair defeated Carmella w James Ellsworth. October 1-2, 2017 – Live Event: Becky Lynch, Charlotte Flair and Naomi defeated Carmella, Lana and Natalya. October 3, 2017 – SmackDown Live: Carmella and Natalya w James Ellsworth defeated Becky Lynch and Charlotte Flair. October 10, 2017 – SmackDown Live: Becky Lynch defeated Carmella. October 23, 2017 – RAW: Carmella showed up with the rest of the SmackDown Live roster and attacked the Monday Night RAW roster. October 24, 2017 – SmackDown Live: Becky Lynch defeated Carmella w Carmella, Charlotte Flair, Naomi and Tamina in a 5-way match. October 31, 2017 – SmackDown Live: Becky Lynch, Charlotte Flair and Naomi defeated Carmella w James Ellsworth, Natalya and Tamina in a dark match. November 7, 2017 – SmackDown Live: Becky Lynch defeated James Ellsworth w Carmella. Carmella kicked Ellsworth in the face after the match. November 2-6, 8-12, 2017 – Live Event: Becky Lynch, Charlotte Flair and Naomi defeated Carmella, Lana, Natalya and Tamina in a handicap match. November 26, 2017 – Live Event: Charlotte Flair and Naomi defeated Carmella, Natalya and Tamina in a handicap match. November 27, 2017 – Live Event: Charlotte Flair and Naomi defeated Carmella, Lana and Natalya in a handicap match. December 14, 2017 – Tribute To The Troops (Taped): Charlotte Flair defeated Carmella and Ruby Riott in a 3-way match. December 27, 30, 2017 – Live Event: Charlotte Flair defeated Carmella, Natalya and Tamina in a 4-way match to retain the women’s title. January 6-7, 2018 – Live Event: Charlotte Flair defeated Carmella, Natalya and Tamina in a 4-way match to retain the women’s title. January 13, 2018 – Live Event: Becky Lynch, Charlotte Flair & Naomi defeated Carmella, Natalya & Tamina and The Riott Squad (Liv Morgan, Ruby Riott & Sarah Logan) in a 3-way tag team match. January 20-21, 2018 – Live Event: Becky Lynch, Charlotte Flair and Naomi defeated Carmella, Lana, Natalya and Tamina in a handicap match. January 28, 2018 – Royal Rumble: Carmella entered the Royal Rumble match at #17 but was won by Asuka. January 30, 2018 – SmackDown Live: Carmella attempted to cash in her money in the bank on Charlotte Flair. February 5, 2018 – Live Event: Charlotte Flair defeated Carmella, Lana and Natalya in a 4-way match to retain the women’s title. February 11-12, 2018 – Live Event: Charlotte Flair defeated Becky Lynch, Carmella, Lana and Natalya in a 5-way match to retain the women’s title. February 13, 2018 – 205 Live: Becky Lynch and Naomi defeated Carmella and Natalya in a dark match. February 17-18, 2018 – Live Event: Charlotte Flair defeated Carmella and Lana in a 3-way match to retain the women’s title. March 3-4, 2018 – Live Event: Becky Lynch and Naomi defeated Carmella and Lana & The Riott Squad (Liv Morgan and Sarah Logan) w Ruby Riott in a 3-way tag team match. March 6, 2018 – SmackDown Live: Becky Lynch defeated Carmella. March 11, 2018 – Fastlane: Carmella and Natalya defeated Becky Lynch and Naomi. March 12, 2018 – Live Event: Becky Lynch, Charlotte Flair and Naomi defeated Carmella, Lana and Natalya & The Riott Squad (Liv Morgan, Ruby Riott and Sarah Logan) in a 3-way tag team match. March 13, 2018 – SmackDown Live: Carmella defeated Naomi. March 25, 2018 – Live Event: Becky Lynch and Naomi defeated Carmella and Lana. March 31, 2018 – Live Event: Becky Lynch, Charlotte Flair and Naomi defeated Carmella, Lana and Natalya & The Riott Squad (Liv Morgan, Ruby Riott and Sarah Logan) in a 3-way tag team match. April 3, 2018 – SmackDown Live: Carmella once again attempted to cash in her money in the bank. April 8, 2018 – WrestleMania 34: Carmella was in the WrestleMania Women’s won by Naomi. April 10, 2018 – SmackDown Live: Carmella defeated Charlotte Flair by cashing in the Money In The Bank to win the women’s title. April 21-23, 2018 – Live Event: Carmella defeated Becky Lynch and Charlotte Flair in a 3-way match to retain the women’s title. April 24, 2018 – SmackDown Live: Carmella & Charlotte Flair signed their contract for the match at WWE Backlash. May 6, 2018 – Backlash: Carmella defeated Charlotte Flair to retain the women’s title. May 11-14, 2018 – Live Event: Becky Lynch defeated Carmella by disqualification. Carmella retain the women’s title. May 15, 2018 – SmackDown Live: Asuka crashes the Mellabration. May 22, 2018 – SmackDown Live: Carmella defeated Becky Lynch in a dark match to retain the women’s title. May 29, 2018 – 205 Live: Carmella defeated Charlotte Flair in a dark match to retain the women’s title. June 2-3, 9-10, 2018 – Live Event: Carmella defeated Charlotte Flair to retain the women’s title. June 5, 2018 – SmackDown Live: The Princess of Staten Island attempts to embarrass Asuka. June 17, 2018 – Money In The Bank: Carmella defeated Asuka to retain the women’s title. James Ellsworth returned and distracted Asuka. June 19, 2018 – SmackDown Live: Asuka confronts Carmella & James Ellsworth. June 29, 2018 – Live Event: Carmella defeated Becky Lynch to retain the women’s title. June 30, 2018 – Live Event: Asuka defeated Carmella by disqualification. Carmella retains the title. July 9, 2018 – Live Event: Carmella defeated Naomi to retain the women’s title. July 15, 2018 – Extreme Rules: Carmella defeated Asuka to retain the women’s title. James Ellsworth was inside a shark cage. July 16, 21, 2018 – Live Event: Carmella defeated Naomi to retain the women’s title. July 24, 2018 – SmackDown Live: Becky Lynch defeated WWE SmackDown Live women’s champion Carmella in a non-title match. July 28, 30, 2018 – Live Event: Carmella defeated Naomi to retain the women’s title. July 31, 2018 – SmackDown Live: Charlotte Flair defeated WWE SmackDown Live women’s champion Carmella in a non-title match. August 5, 2018 – Live Event: Carmella defeated Naomi to retain the women’s title. August 14, 2018 – SmackDown Live: Charlotte Flair, Becky Lynch & Carmella came face to face in talking about their match at SummerSlam. August 19, 2018 – SummerSlam: Charlotte Flair defeated Becky Lynch and Carmella in a 3-way match to win the women’s title. August 25-27, 2018 – Live Event: Charlotte Flair defeated Carmella by disqualification to retain the women’s title. Asuka and Charlotte Flair defeated Becky Lynch and Carmella. August 28, 2018 – SmackDown Live: Charlotte Flair defeated Carmella to retain the women’s title. September 1-3, 2018 – Live Event: Charlotte Flair defeated Carmella by disqualification to retain the women’s title. Asuka and Charlotte Flair defeated Becky Lynch and Carmella. September 4, 2018 – SmackDown Live: R-Truth w Carmella defeated The Miz w Maryse. September 4, 2018 – 205 Live: Charlotte Flair defeated Becky Lynch and Carmella in a 3-way, dark match to retain the women’s title. September 8-10, 2018 – Live Event: Charlotte Flair defeated Carmella to retain the women’s title. September 11, 2018 – SmackDown Live: Andrade Almas w Zelina Vega defeated R-Truth w Carmella. September 17, 2018 – Live Event: Becky Lynch defeated Carmella and Charlotte Flair in a 3-way match to retain the women’s title. September 25, 2018 – SmackDown Live: R-Truth & Carmella hosted a episode of Truth TV with special guest Daniel Bryan. October 2, 2018 – SmackDown Live: Carmella and R-Truth defeated Andrade Almas and Zelina Vega. October 9, 2018 – Mixed Match Challenge: AJ Styles and Charlotte Flair defeated Carmella and R-Truth. October 13, 2018 – Live Event: Carmella defeated Zelina Vega. October 15, 2018 – Live Event: Carmella and R-Truth defeated Andrade Almas and Zelina Vega. October 20, 2018 – Live Event: Asuka and Carmella defeated The IIconics (Billie Kay and Peyton Royce). October 21, 2018 – Live Event: Asuka, Carmella and Charlotte Flair defeated Becky Lynch & The IIconics (Billie Kay and Peyton Royce). October 28, 2018 – Evolution: Carmella was in the battle royal won by Nia Jax. October 30, 2018 – SmackDown Live: WWE United States champion Shinsuke Nakamura defeated R-Truth w Carmella in a non-title match. November 3, 5, 2018 – Live Event: Lana and Rusev defeated Carmella and R-Truth. November 6, 2018 – Mixed Match Challenge: Jimmy Uso and Naomi defeated Carmella and R-Truth. November 8-9, 2018 – Live Event: Lana and Rusev defeated Carmella and R-Truth. November 20, 2018 – Mixed Match Challenge: Carmella and R-Truth defeated Lana and Rusev. November 27, 2018 – SmackDown Live: Asuka defeated Billie Kay and Carmella and Lana and Mandy Rose and Naomi and Peyton Royce and Sonya Deville and Zelina Vega in a battle royal to become #1 contender for the women’s title. December 4, 2018 – Mixed Match Challenge: Carmella and R-Truth defeated Charlotte Flair and Jeff Hardy. December 11, 2018 – Mixed Match Challenge: Carmella and R-Truth defeated Asuka and The Miz in the semi-finals. December 17, 2018 – Live Event: Carmella and R-Truth defeated Andrade Almas and Zelina Vega. December 18, 2018 – SmackDown Live: Mandy Rose and The Miz defeated Carmella and R-Truth. December 26-28, 2018 – Live Event: Carmella and R-Truth defeated Andrade Almas and Zelina Vega. January 5-7, 2019 – Live Event: Carmella and R-Truth defeated Andrade Almas and Zelina Vega. January 8, 2019 – SmackDown Live: Becky Lynch defeated Carmella and Charlotte Flair in a 3-way match to become #1 contender for the SmackDown Live women’s title. January 27, 2019 – Royal Rumble: Carmella entered the Royal Rumble match at #30 but was won by Becky Lynch. February 2-3, 2019 – Live Event: Carmella and Kairi Sane defeated The IIconics (Billie Kay and Peyton Royce). February 5, 2019 – SmackDown Live: Mandy Rose and Sonya Deville defeated Carmella and Naomi & The IIconics (Billie Kay and Peyton Royce) in a 3-way tag team match. February 9-10, 2019 – Live Event: Carmella and Naomi defeated Mandy Rose and Sonya Deville. February 12, 2019 – SmackDown Live: Carmella and Naomi defeated Mandy Rose and Sonya Deville & The IIconics (Billie Kay and Peyton Royce) in a 3-way tag team match. @somaniaakash @themoralskeptic @LaMoustachedMan @CarmellaWWE Multi time champ? Might wanna sit down buddy and go back to the drawing board for comebacks.